The S12 generation Nissan Silvia was sold in the USA as the Datsun 200SX because the Nissan and Silvia names were not acceptable over here for reasons nobody understands. In later years, the front-engine rear-drive 200SX was available with a version of the VG30E V6 from the 300ZX/Maxima, but the coolest version has a the pizza box hood scoop and turbo inline-4. 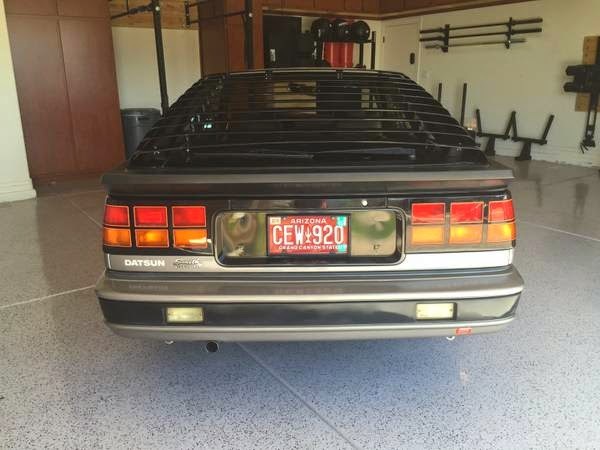 Find this 1984 Datsun 200SX Turbo offered for $5,000 in Mesa, AZ. Tip from FuelTruck. 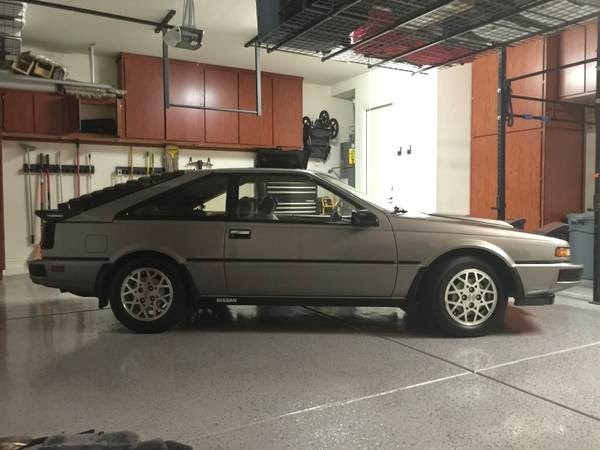 This 200SX looks in great shape compared to most you've seen that have either been neglected by their owners or modified by the Fast'n'Furious crowd. This one looks like a creampuff and is only for sale because the current owner (in his own words:) sorta, kinda bought it without my wife's permission - - I just couldn't pass it up!!! Needless to say, that back fired on me. lol. LOL, indeed. Under that Texas-sized hood scoop is a 1.8 liter CA18ET inline-4 that is turbocharged and non-intercooled to produce 135 horsepower and 141 ft-lbs of torque. It isn't particularly powerful, but it makes a good match for the 2500-ish pound S12 rear-drive chassis. 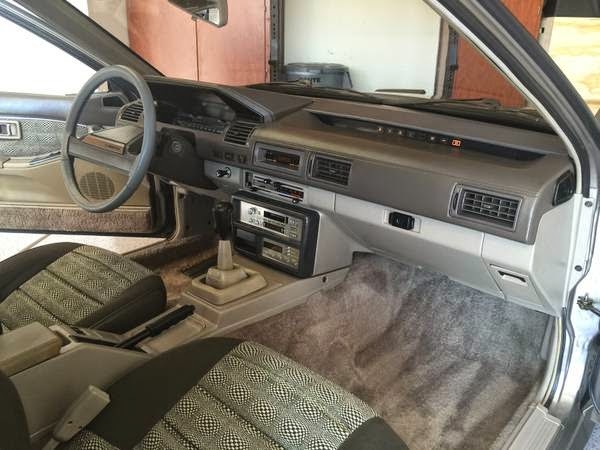 On the inside we see a very well preserved dash, funky seat inserts and a very 80s dash board setup with idiot lights aimed at the passenger. The shifter sticks up like something you'd use to stir a witch's pot and will provide you with hours of entertainment. Another neat car! Will the wonders never cease? I wish the floor of my garage looked like that. I wish my garage looked like that! It's so clean and well organized! Seller has good taste: belt drive openers, stamped and triple coated concrete floors. They are also no strangers to entertaining, given the number of stacked chairs and folding tables arranged vertically in the overhead storage cages. @DoctorDel - yeah, floors like that make me drool. Unfortunately, up here in the Salt-Belt, you have to fight hard just to stop the concrete dissolving, if you use your garage to house your daily drivers. Also, since the daily drivers will be dripping a salty slurry pretty much non-stop for many months each year, those polished concrete floor are absolutely deadly. Textured finish is the only safe option. If I wanted a Garage-Mahal, I would pretty much have to have a separate building. Sadly, that's not gonna happen, so I content myself with trying to have a good work area in the garage I already have. It's not the neatness or organization that gets me, it's the floors. My garage is neat and organized enough that I can find stuff and work on stuff. But I'm getting really tired of laying on the bare concrete. When I bought my house, the concrete was too green to paint and after moving my stuff and cars in, it would be a pain to move it all out and paint it. Wish I could have figured out a way. I don't see a tool box or even one single piece of equipment that could be useful in working on a vehicle. I think that's why it's so clean.... I think most commenter's here have only ever seen their garage close to this clean once... the day they took possession of the property. As for the car, holy crap That's like brand spanking new. Someone should buy this beasty and do a sr20det swap. And then drive the balls out of it... oh wait I just had a vision but it may take some time to aquire the right bits as they haven't yet released the car. That new gm twin turbo V6 that they are stuffing into the Cadillac ats(I think). That could make some kind of durrty sled out of this. I wish I could finance and find the time to build some of the things that stew in my cranium. I'D BE RICH!¡¡¡¡ OK probably not. We don't see any tools because they are hermetically sealed in a purpose built container that has been thoughtfully designed and hidden from view. This is garage is like an overly clean desk. Where's the freakin' clutter that gives it is lived in look? I'm all about cleaning the grease off my tools, but ya gotta have some grease, or at least the smell of some type of automobile fluids to give the place any ambiance. Who likes to drink beers with the guys in the hospital cafeteria... hell, no! You need a bowling alley with its years of grime and the combined scent of desenex/simple green/cigarettes which has permeated the asbestos tiles in the ceiling and the dark wood paneling on the walls to have a really memorable experience! And just in case you don't know what I'm talking about, let Tab Benoit regale you with the tale of the Bowling Monkey , to let it sink in... (It takes awhile to get to it, but its worth the entire listen) PS. If you don't know who Tab Benoit is, set aside another 30 minutes of your Sunday youtube time to get acquainted with some clean (no pedals, just a guitar and amp) blues. What an amazing car to survive in such condition. It would seem that the original owner was every bit as fussy as the current one; which leads me to a couple of semi-related rants. My garage, not even close, although everything is organized; it’s like me, ugly but functional. My walls are covered in ½ inch plywood which is more resistant to holes from tools thrown in frustration than drywall and if I need to hang anything but the heaviest stuff I don’t need to find studs. If I do damage a section of wall I just back out the screws and hang a new sheet in its place. This second point is destined to make me as popular as an IRS agent at a Power Ball winner’s celebration party. I’ve had my fill of car ads and commentary with the following phrases; wife forces sale, wife says it must go, wife won’t let me keep it, wife would kill me if a bought it, would love to have it but wife won’t let me, etc. If your wife is that much of a shrew, divorce her. I would then suggest military service or a stint in the North Dakota oil fields to reclaim your man-card. It is possible to treat your wife with love, dignity, and respect, and still not have to raise your hand to go to the bathroom. I mean Everybody Loves Raymond was a great show but it’s no way to run your life. OK, I’m done. It is possible this seller was just trying to be cute but the old First Sergeant in me has had enough. All interesting comments, MarveH! Thanks for posting them. My take is that there's usually a lack of communication perpetrated by one or both sides. I've said this before in another context but transmission and receipt of information between a married couple is even more important than usual. Like you said, if it ain't working and you can't fix it (by yourselves or with professional help) then maybe it's time to take a different fork in the road. Your usage of cars in this example is a good one that has much wider implications. And the advice given to a son should be something like "Marry your best friend who brings out the best in you," just as you imply. A happy wife is a happy life. If there's no happy...then it's toxic. BTW, I did my darndest to marry the wrong woman. Fortunately, fate had other plans for me. So it's not like I'm an expert in relationships. I just got lucky. VERY lucky. It's interesting to note the things that are wrong with the Datsun. Surprising the things that are listed as broken and need fixing. The owner is clearly retentive...but he left these things? Weird. Still an awesome find and I wish I could buy it. These were decent cars, certainly for their day, and when you compare what the old RWD Japanese sports coupes go for vs their FWD replacements you clearly see what the market values. I'd love to love the current Scoobota but it seems to me they could have easily put a little more back seat in the thing. A great piece of rolling 80's memorabilia. I always wanted one, but they never seemed to be for sale around here. The badging and tacked - on hood bulge (like on my old 82 Mustang GT) are way cool in my book. A cool competitor for early SVOs, Mopar 2.2 turbos and the like. Sweet find. I sold Nissans in '87 and had the opportunity to drive a couple of these as used cars. They were pretty good, but when the 200 SX SE came out with the same V6 as the 300ZX it was a much more fun car to drive and sounded a lot better. A couple of us us ran each other against the 300ZX and the 200SX consistently beat the 300ZX. I also found it to be more tossable. Turbo or V6 they were both fun.